It’s often assumed that Emerald Coast has received the most polish during the Dreamcast-Gamecube transition. 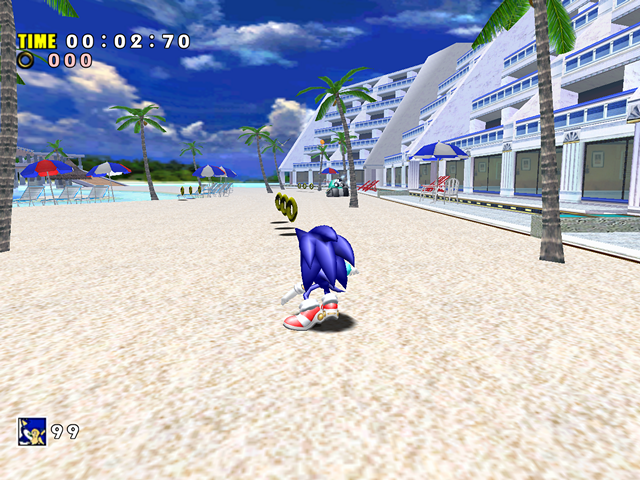 And indeed, Emerald Coast is one of the two areas in the entire game that features prominent drop shadows made of semi-transparent models, the other one being Station Square. 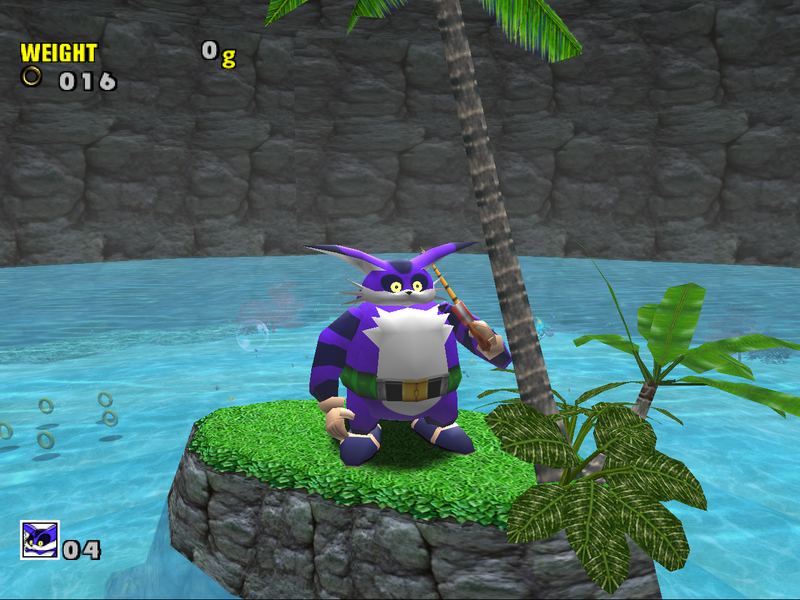 However, the level itself has gone through just as many graphical downgrades as the other stages, possibly even more. The Dreamcast version has a low-resolution water texture with choppy animation, while the Gamecube water consists of 3 layers: the green part, transparent water waves (same resolution as the Dreamcast texture), and the bump mapped surface that creates distortions. 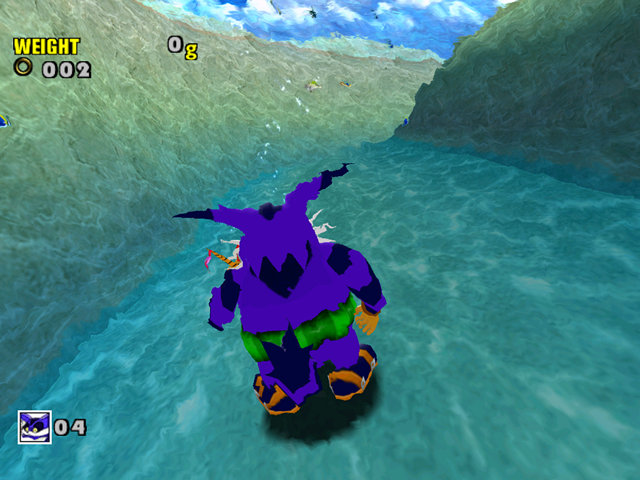 The PC version lacks the distortion effect and uses a different sea texture. Even with all the limitations and differences this could have ended up looking nice, but there are several problems with the water’s implementation* in SADX Emerald Coast. *There is a separate section discussing problems with SADX water here. 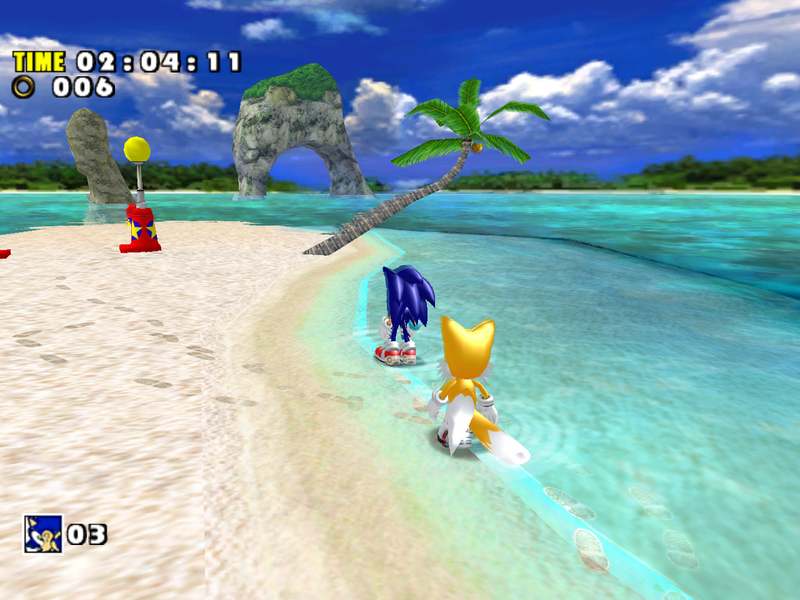 It’s quite possible that the seashore was made to look this way because the Dreamcast design of the seashore didn’t work with the SADX engine. It would’ve been trivial to fix as demonstrated by Dreamcast Conversion. Check out the Transparency section for more information on transparency problems and how they can be fixed. 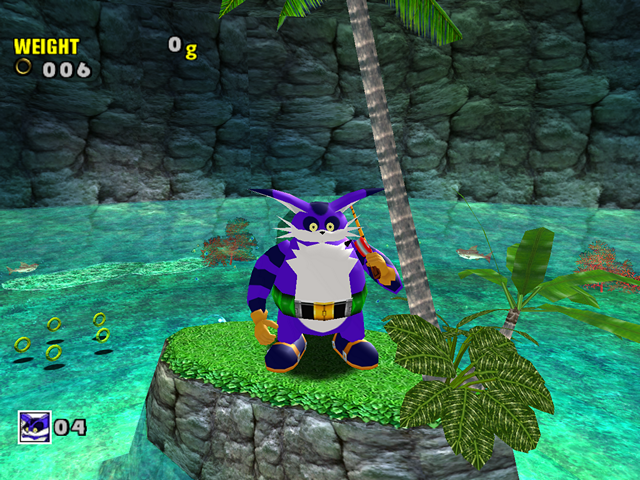 The seashore isn’t the only part that has received questionable redesigns in SADX. 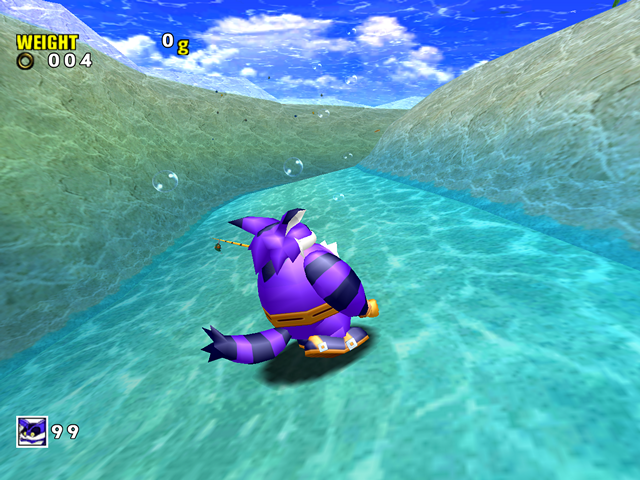 In the first video comparison near the top of this page you may notice the tiny shadows underneath the water surface. 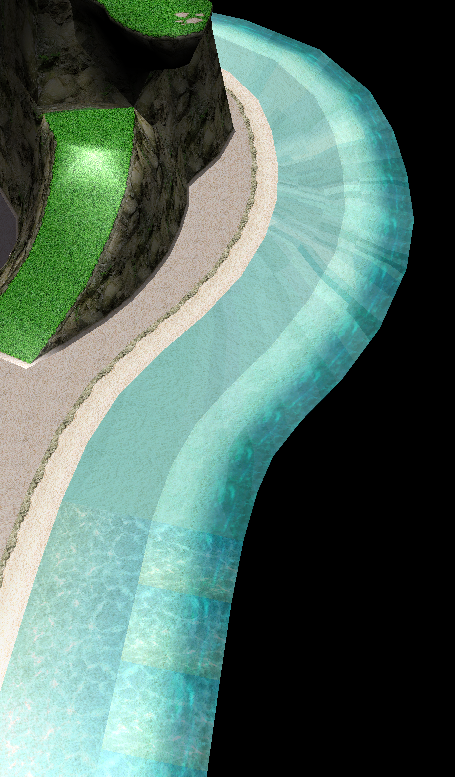 They aren’t immediately noticeable, but they add to the overall amount of detail. Their opacity was reduced in SADX, making them almost invisible. Here’s what they could have looked like if they retained their opacity and if the water texture was slightly more transparent. 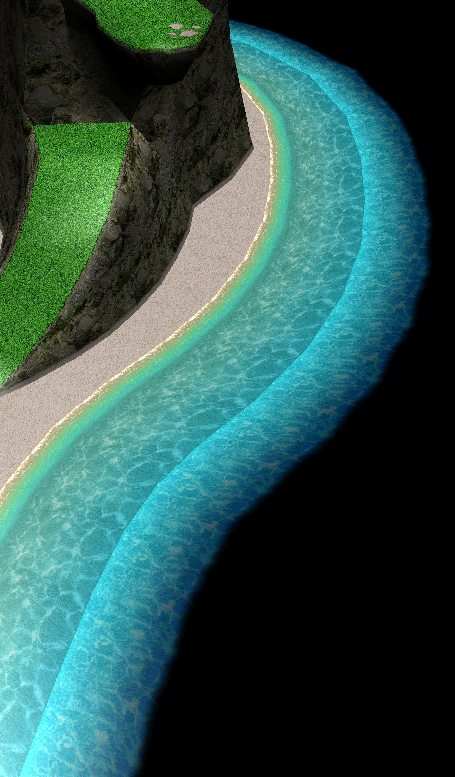 It becomes more noticeable when you see the whole area from above. 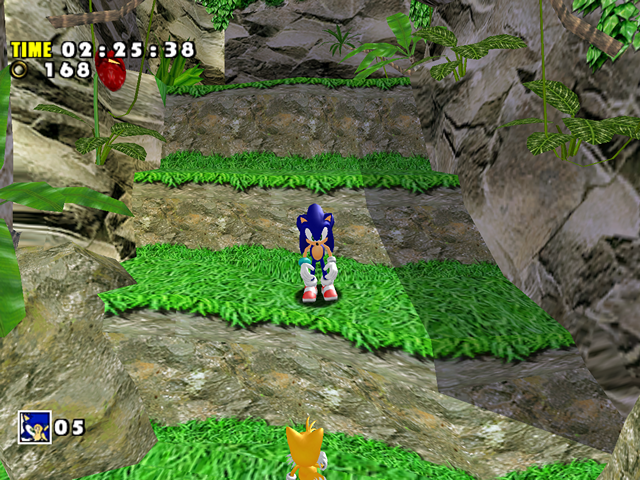 There is a similar area with broken UVs near the end of Act 2 as well. 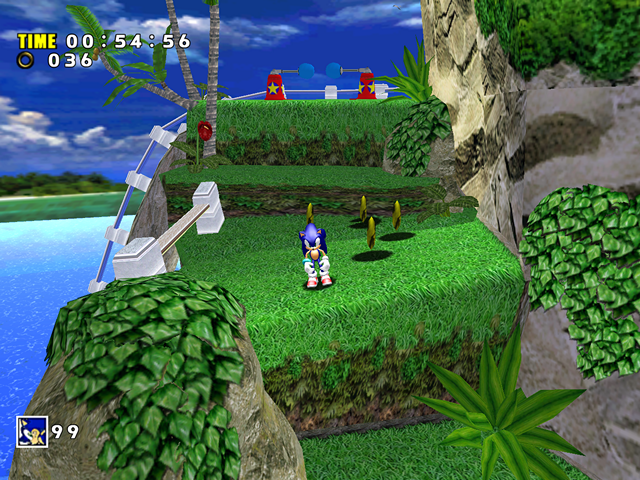 To compensate (probably) for the lack of those shadows, the SADX version of the level has additional pieces of level geometry added around the stage. 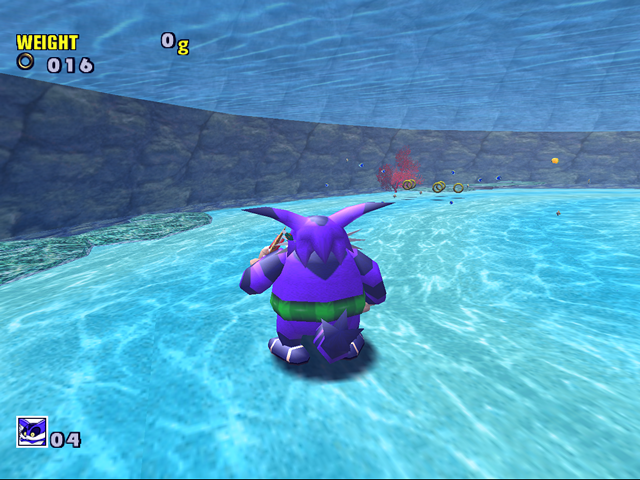 They prevent the bottom of the skybox from being visible through the overly transparent water, which is probably their main function. 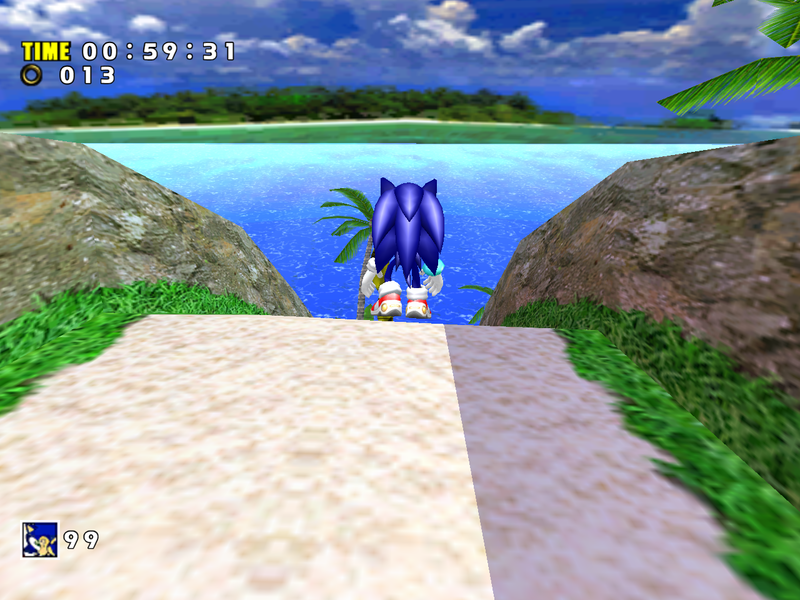 However, there’s a transparency sorting problem near the start of Act 1 that makes entire level pieces disappear at some camera angles. The problem persists in all later ports, but becomes even more noticeable without the distortion effect, which means it looks like this in all versions of SADX after the Gamecube port. This problem is fixable by flipping a single flag in the level’s model list. 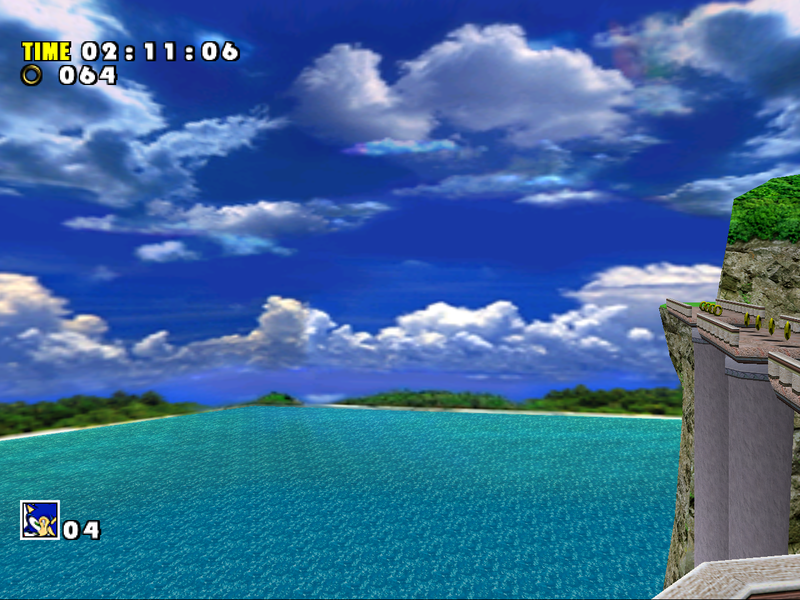 The skybox obscures all objects beyond it, which is needed for the ocean to look correct. 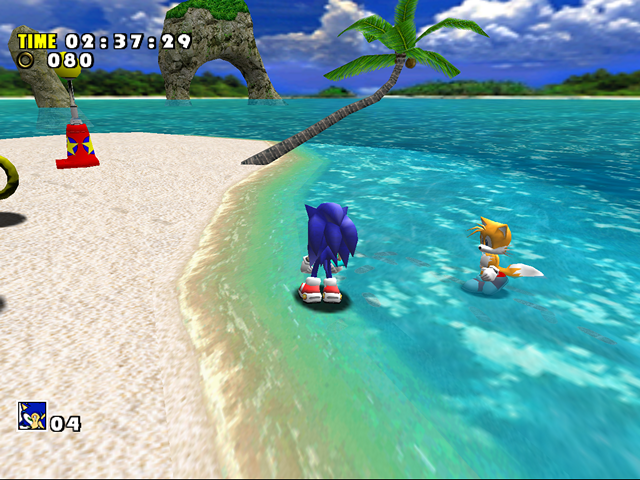 In all versions of SADX, however, the ocean doesn’t reach far enough so it ends up being cut off. The increased skybox scale in SADX is commonly mistaken as “better draw distance”, but it has more to do with the size of the skybox rather than an actual draw distance difference. 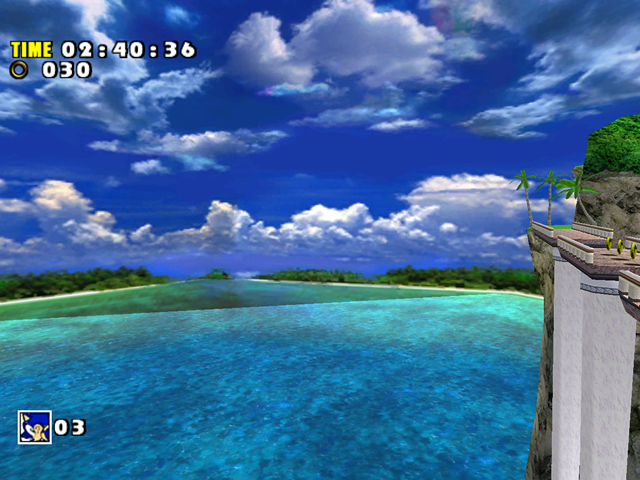 As the skybox was made bigger in SADX, it no longer covers the “edges” of the ocean. 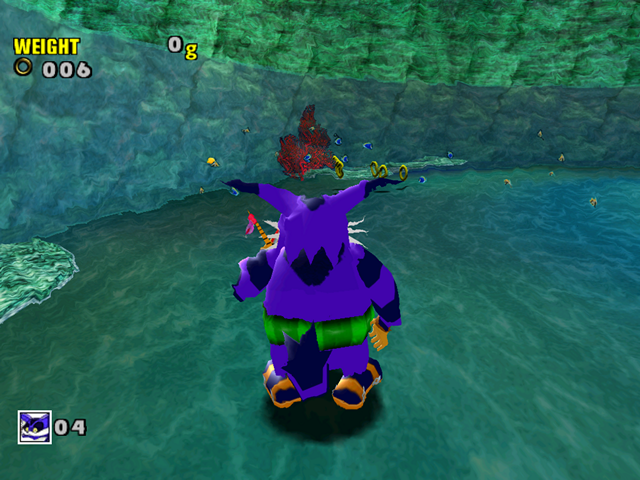 The PC players have probably noticed that the ocean blinks every few frames. It’s caused by the transparent water wave textures, which have different alpha channels for some frames of the animation. 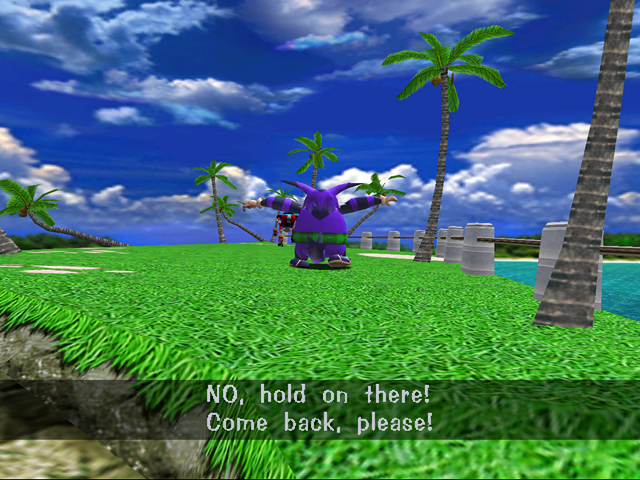 This happens on the Gamecube as well, but it’s less noticeable because of the distortion effect. It doesn’t happen in the original game. In Sonic’s Act 2 and Gamma’s Act 1 several stone platforms that served as decorations in the original game were removed in SADX. 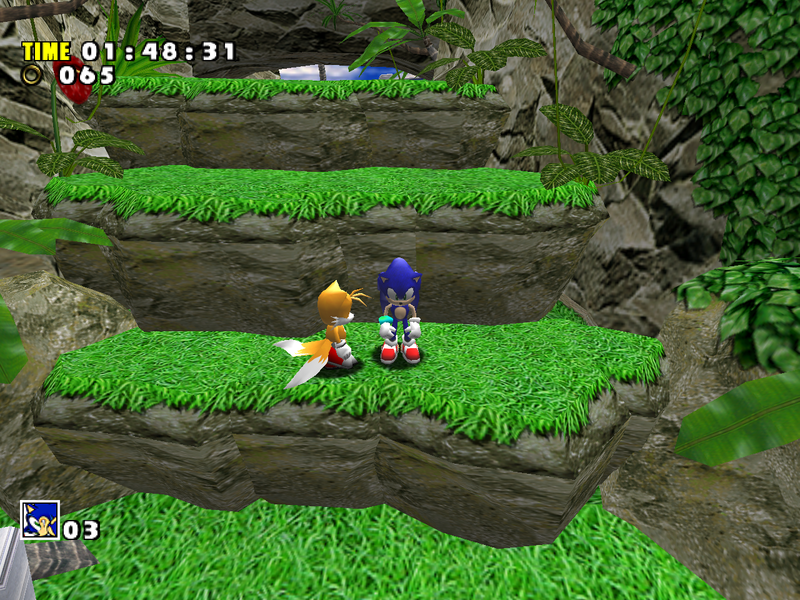 In SADX they cause minor Z fighting when placed next to each other, most likely due to SADX using a less precise Z Buffer. 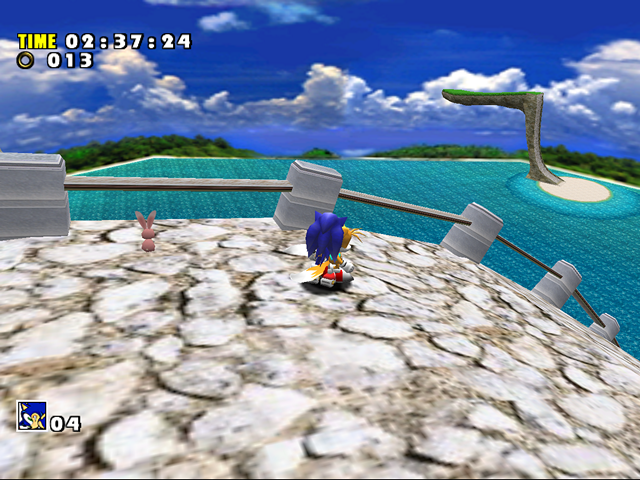 It could’ve been fixed with minor position adjustments, but in some areas the platforms were removed entirely. This also makes some parts of the scenery (like the red flower in the second screenshot) look suspended in the air because its position wasn’t adjusted properly. 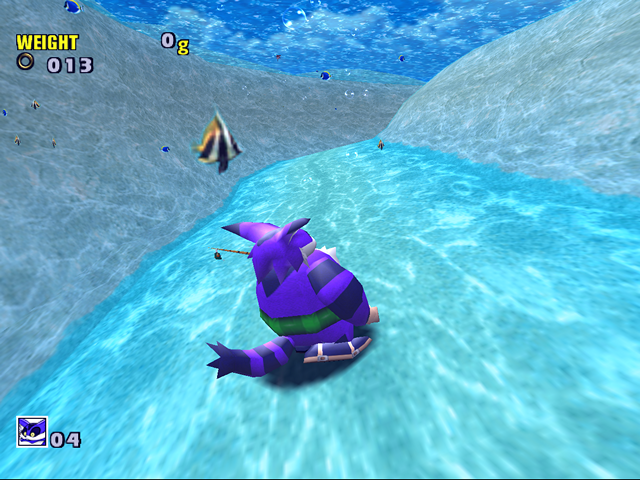 As you can see, the water just moves up and down in SADX. 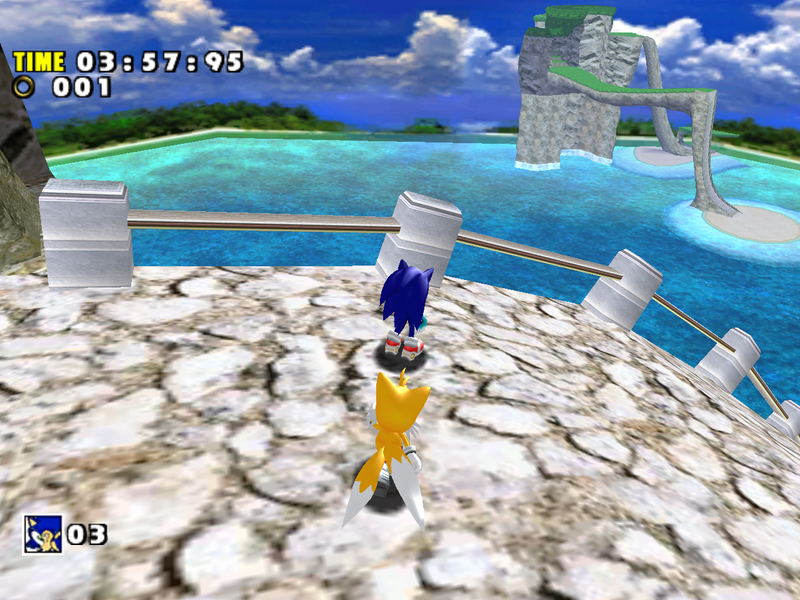 This creates an inconsistency with the bridge that still moves like on the Dreamcast, which makes it go underwater. Interestingly the code for the wave effect is still in the game, it’s just never called. 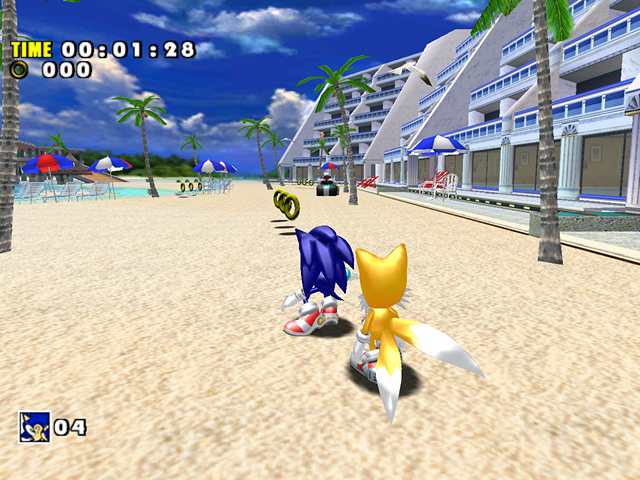 As demonstrated by Dreamcast Conversion, it is possible to enable the wave effect in SADX. It required changes to the way the water is rendered, however, because the way SADX renders water in Emerald Coast isn’t compatible with dynamic vertex shifting. 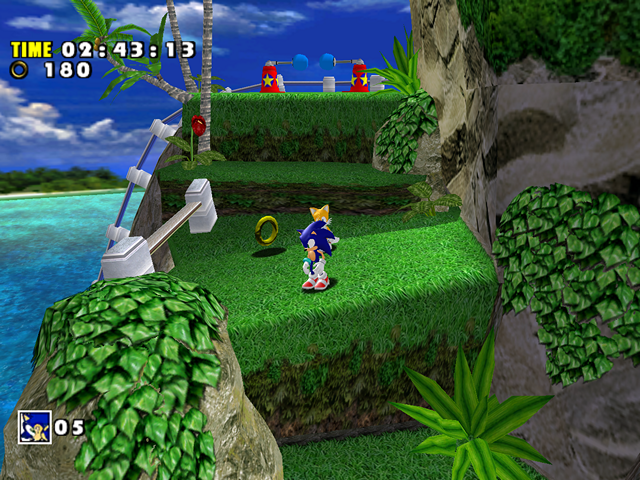 To be fair, some of the changes made to the SADX version of the level can count as enhancements. 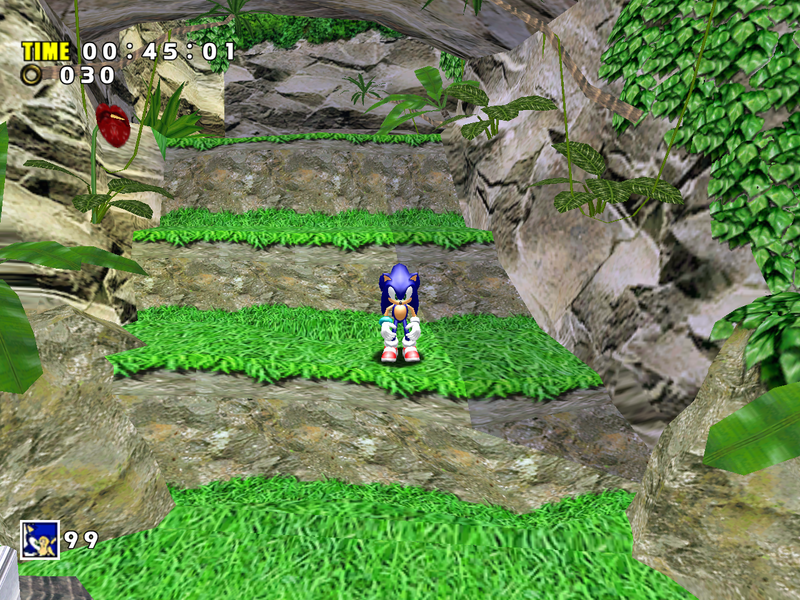 Even though they were likely added only to camouflage the removal of lighting (more on that in the Lighting section), the vertex colors are a nice touch in some areas. 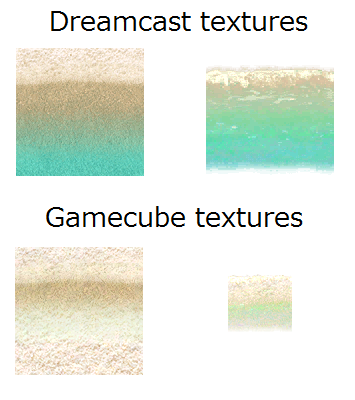 For example, the Gamecube version features a gradation in sand color. However, this is not visible in the PC port because of the fog that washes out the colors, even on things close to the player. 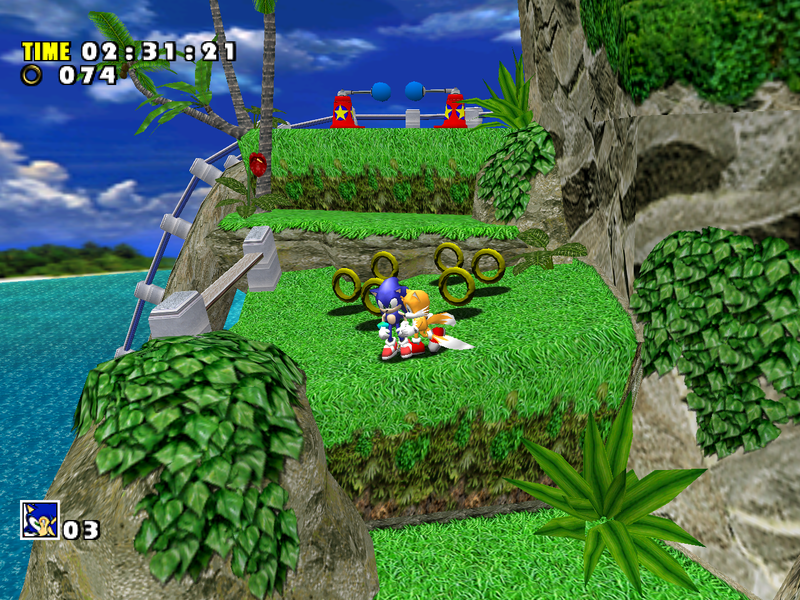 In the second act of Emerald Coast there are supposed to be two Sweeper badniks in the pool, but SADX has only one. 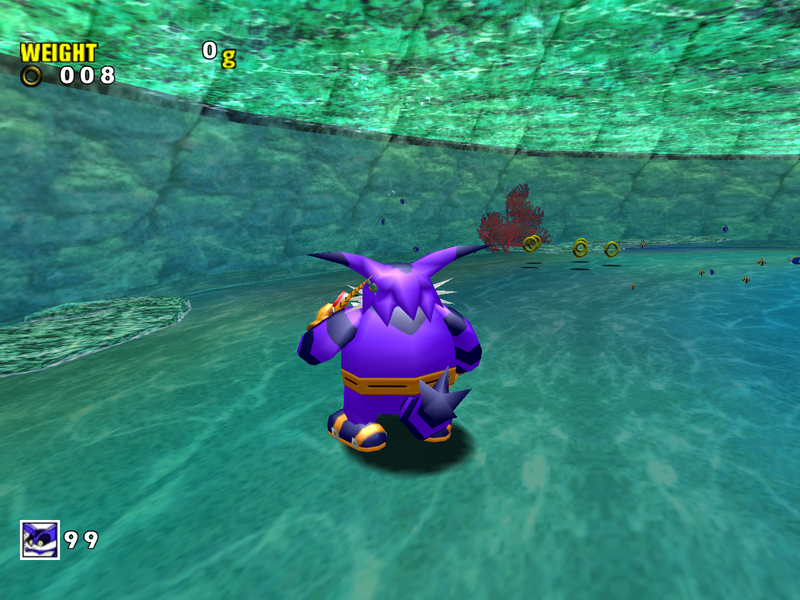 This might seem like a minor thing to complain about, but the reason the badnik doesn’t show up is a programming error in the ports that causes many other enemies to not spawn. A similar problem happens with Leon badniks in different levels, the Egg Keeper in Final Egg 1* and the Sweepers in Twinkle Park Act 2. 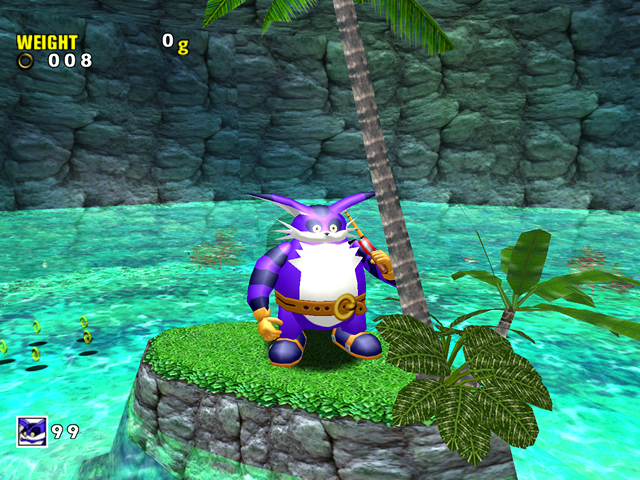 *Interestingly the Egg Keeper reappears in the Steam version, however the other enemies are still not fixed. 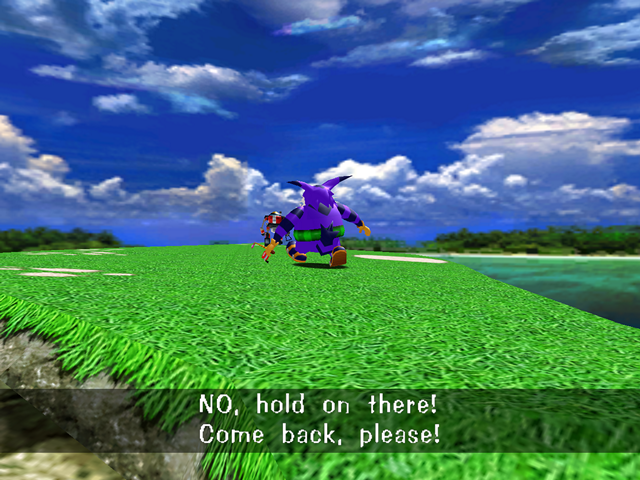 As can be seen from the above discussion, the level that is considered to be one of the most improved and polished levels in the ports has had quite a few downgrades from the original Dreamcast version. The enhancements introduced in this level are superficial and (arguably) don’t make up for the removal of effects and low texture quality. There are two ways to improve the experience in the PC version: you can use Dreamcast Conversion to revert to the original level, or you can install the Enhanced Emerald Coast mod that restores the ocean wave effect and fixes several issues with the SADX level without reverting it to the Dreamcast version.